What is called “losing” in chess may constitute winning in another game. I have for quite some time been intending to wade into the COIN debate (that’s “counter-insurgency,” for those among you without an absolute command of inherently ambiguous acronyms), and while this post is not going to be that post which takes COIN as the leitmotif, I will here approach COIN indirectly by taking a bit of the debate on the margins of COIN. To paraphrase Wittgenstein’s well known remark about Gödel — “My task is, not to talk about (e.g. ), Gödel’s proof, but to pass it by.” — I can say that, in the present context, my task is not to talk about COIN, but to pass it by. And I will pass by COIN by way of a detour through SoT. Now we have another acronym, so I must tell you that “SoT” means “strategy of tactics.” I found this on the Ink Spots blog, in a piece by Jason Fritz titled be-SoT-ted: COIN tactics and strategy through the lens of ends, ways, means. Fritz makes several interesting assertions that I would like to review. Fritz notes that Gian Gentile originated (or popularized) the notion of “COIN is the strategy of tactics,” implying that COIN has no true strategic content, and that a military force that makes COIN its central doctrine is a force essentially without a strategy. Nation-building using population-centric COIN as its centerpiece should be viewed as an operation. It should not be viewed as strategy, or even policy for that matter. But what is occurring now in Afghanistan, for example, at least for the American Army, is a “strategy of tactics.” If strategy calls for nation-building as an operational method to achieve policy objectives, and it is resourced correctly, then the population-centric approach might make sense. But because the United States has “principilized” population-centric COIN into the only way of doing any kind of counterinsurgency, it dictates strategy. …the most damaging consequence to the American Army from the new zeitgeist of COIN is that it has taken the Army’s focus off of strategy. Currently, US military strategy is really nothing more than a bunch of COIN principles, massaged into catchy commander’s talking points for the media, emphasizing winning the hearts and minds and shielding civilians. The result is a strategy of tactics and principles. My main beef with COIN as a strategy of tactics (I’m going to go ahead and call it SoT from now on) is that all military strategy is made up in part as a summation of its tactics. In the ends-ways-means calculus of strategy, a large chunk of the “ways” section is the aggregation of tactical actions based on operational concepts and/or TTPs… This is an elegant way of saying it, but all military strategies are in part SoT, in a non-pejorative sense. You can’t have strategic success without tactical successes. COIN, IW, UW, maneuver warfare are all common in this regard. …for now I disagree that COIN is inherently a strategy of tactics any more than any category of tactics can be labeled a strategy. Those tactics may be part of a military strategy that logically connects ends, ways, and means. On the other hand, COIN tactics may be the commander’s ways in an illogical or inaccurate strategic equation and thus we may see COIN as a SoT. While I am in complete agreement that you cannot have strategic success without tactical successes, it is important to point out that tactical objectives can be antithetical to strategic objectives, so much so that a “successful” tactical move may involve a local defeat in the interest of a global strategic victory (and here I mean “global” not as “worldwide” but simply as a contrast to “local”). If your skirmishers can flush out an ambush before that ambush can be sprung on the main body of your troops, the skirmishers may lose this engagement but in so losing they may have saved the day for the force on the whole. What is called “losing” in tactics may be called “winning” in another game, namely, the game of strategy. The problem here (if there is a problem) can be neatly illuminated by interpolating a distinction into this discussion, so I am going to make a distinction between formal and informal strategy, or formal and material strategy (either set of terms will do). Although I am introducing my own terminology, the idea is not at all new. Actually, I’m going to make two distinctions. Among strategies of tactics we can distinguish those that add up to more than the sum of their parts, and those that fail to add up to anything. A number of tactics thrown together in an operational context may only apparently have little or nothing to do with each other, but it emerges in time that they do in fact function coherently as a whole. This whole turns out to be a strategic whole. This is when tactics add up to more than the sum of their parts, and this is what Adam Smith called the “invisible hand” and what Hegel called the “cunning of reason.” Sometimes, things get done quite without our knowing how they get done. Fritz, in suggesting that all strategies may be strategies of tactics comes close to this idea that strategy is emergent from a coherent body of tactics. But this, as we know, is not the only possibility. A number of tactics thrown together for an operation may reveal their essential incoherence by ignominiously falling to pieces under the extraordinary stresses of combat. Tactics combined without any overarching idea of what is to be accomplished may be pursued at cross-purposes to each other and become self-defeating. This would be an instance of tactics turning out to be less than the sum of their parts (what I have elsewhere called negative organicism and submergent properties). This seems to be Gentile’s primary concern. History provides adequate examples both of strategy emergent from tactics and strategy failing to emerge from tactics, so we can’t really say that Gentile is right or Fritz is right, because they are both right — just in different circumstances. So here’s where we come to formal strategy and material strategy. A formal strategy is an explicitly formulated doctrine of strategic objectives distinct from the tactical objectives that may be employed to achieve the aims of the strategy. When a formal strategy is formulated, those who are formulating it know that they are formulating it, they know what they want to accomplish, and if any time lines are given for the strategy they will be able to say eventually whether that strategy was successful or a failure. An informal or material strategy is that strategy that emerges in the absence of a formal strategy. A material strategy may be grasped intuitively or instinctively by military commanders on the ground or by politicians in their negotiations in smoke-filled rooms. It is probably the case that most US strategies are informal strategies, which is why US military forces must so often get by with strategies of tactics, because no one can explicitly formulate exactly what is going on. Even when such an explicit statement of a strategy is lacking, however, we should not sell informal strategy short, because in some cases everyone understands, from the Commander-in-Chief to the foot soldiers slogging through the mud, what it is all about. When men die for freedom and democracy without being able to define either freedom or democracy (or the tactics that are consistent with a free and democratic society) they are dying for an informal strategy. Given this distinction, then, between formal and informal strategy, the distinction between strategy and tactics is maintained; in other words, it is not the case that all strategies are strategies of tactics, but rather that informal strategies are strategies of tactics when these tactics do turn out to be coherent and to accomplish something. When strategies of tactics fall apart and a fiasco ensues, then there was no strategy at all — not even an informal one. That’s it right there, and with that we can probably knock it on the head for an early lunch. But I probably should run out the clock with some details. I previously wrote about this in On a Definition of Grand Strategy, where I focused on the role a strategic vision has not only in terms of eliminating or passing over certain alternatives, but also in formulating or settling upon certain alternatives. Like a system of ethics, that not only enjoins us to desist from certain activities but also requires us to perform certain activities, grand strategy is not purely negative; it too, like ethics, does render some alternatives unthinkable, but at the same time it renders other alternatives “thinkable” that might be unthinkable for others. For example, the Final Solution was part of Nazi grand strategy, and while for us The Holocaust is a paradigm of the unthinkable, in the context of Nazi ideology it was not only thinkable but practicable, and so the Nazis bequeathed to history genocide’s proof of concept. Today I want to address a different aspect of the above implied (though not explicit) definition of grand strategy. Specifically, I want to discuss the strategic role of finite resources, which is central to the above quote. Previously I focused on choices, because I wanted to show that our strategic choices (both positive and negative) are conditioned by our strategic vision, and, even more broadly, by the conception of history that furnishes our Weltanschauung (what Foucault called an epistêmê and Kuhn called a paradigm). Although strategic choices are central, no less central is resource allocation. In the implicit definition above, we are forced to make choices because our resources are finite. This implies that, if only our resources were not finite, we might not have to make these choices. Thus resource allocation is more fundamental than the choices it seems to force upon us, because the finitude of resources is the reason for the choice, and not vice versa. 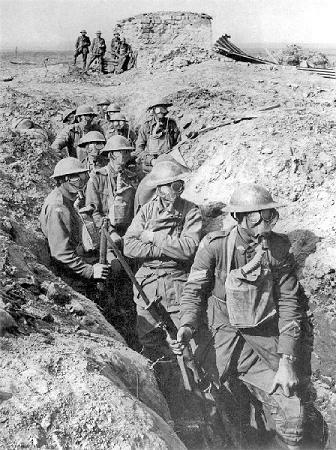 Trench warfare during the First World War. That is to say, Falkenhayn knew that France’s manpower was limited, and that if it could be exhausted by being bled white, Germany could win. Falkenhayn was, in a sense, successful, perhaps too successful, because the same calculus of finitude that applied to France also applied to Germany, and The Battle of Verdun proved to be an equal opportunity slaughterhouse, consuming French and Germans alike, and almost at the same rate. 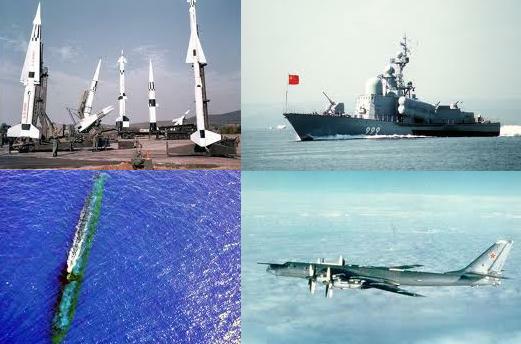 Some of the first intimations of maneuver warfare in its contemporary form emerged from straitened circumstances that forced commanders to work with limited resources. The well-known Brusilov Offensive on the Eastern Front was effective because Brusilov knew that his shells were limited, so instead of a barrage that lasted for days, there was a short, sharp barrage (kept short to minimize the use of shells) followed by an infantry advance. The advance was more successful than most infantry advances during the First World War because the element of surprise had been retained. 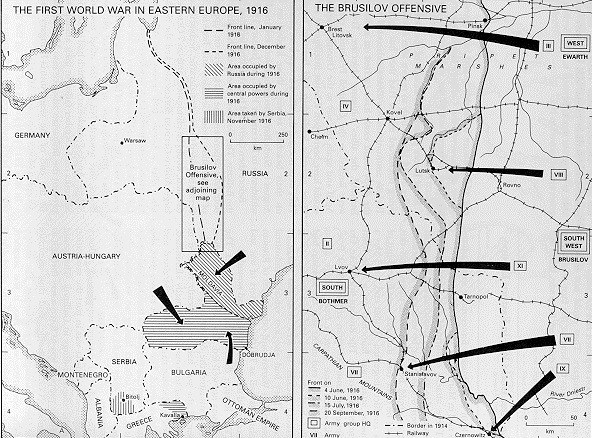 Brusilov’s Order of Battle was also governed by similar considerations of finite resources. 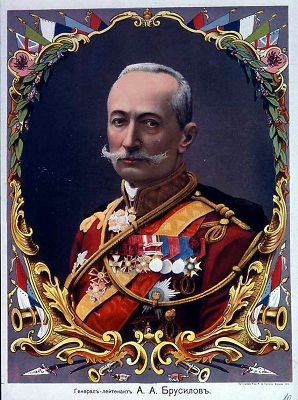 Once Brusilov’s successes got the attention of Moscow, Brusilov was given more men and more shells, and he returned to the same errors of other commanders during the war. No longer forced to be creative, and expecting a never-ending supply of men and shells, he planned as though resources were unlimited, and then he began to fail. The most famous example of a choke point in military history is the Battle of Thermopylae, when a Greek force of about 7,000 held off a Persian army that may have had as many as a million men. The Greeks eventually lost the battle, which culminated in the last stand of King Leonidas with his three hundred Spartans (the subject of a recent film), but the ability of the Greeks to hold back a far larger force for a week was due to the pass of Thermopylae being a geographical choke point, where only a few men could fight shoulder-to-shoulder. Even if the Persians had had two or three million soldiers available, or an unlimited number of soldiers available, they would not have taken the pass any quicker than they did. An armored spearhead from East Germany through the Fulda Gap into West Germany. Another geographical choke point is the Fulda Gap in Germany, which was central to NATO planning during the Cold War. The Fulda Gap is one of the few places that the Warsaw Pact could have employed its superior number of tanks in an invasion of Western Europe. 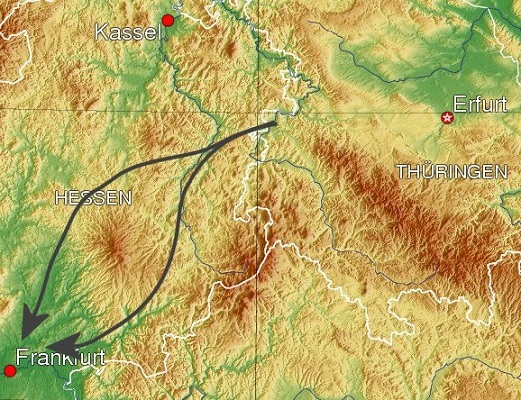 More recently, the Pankisi Gorge has been a focus of strategic thinking in the Caucasus, being a potential transshipment opportunity between Russia and the Middle East. As a pass within a mountainous region, it is the choke point of the Caucasus. Perhaps more familiar than geographical choke points are naval choke points. Wikipedia gives a list of these as follows: Hormuz Strait between Oman and Iran at the entrance to the Persian Gulf, Strait of Malacca between Singapore and Indonesia, Bab-el-Mandeb passage from the Arabian Sea to the Red Sea, Panama Canal and the Panama Pipeline connecting the Pacific and Atlantic Oceans, Suez Canal and the Sumed Pipeline connecting the Red Sea and Mediterranean Sea, The Turkish Straits/Bosporus linking the Black Sea (and oil coming from the Caspian Sea region) to the Mediterranean, The Strait of Gibraltar, Cape Horn, and The Cape of Good Hope. This list could easily be expanded. 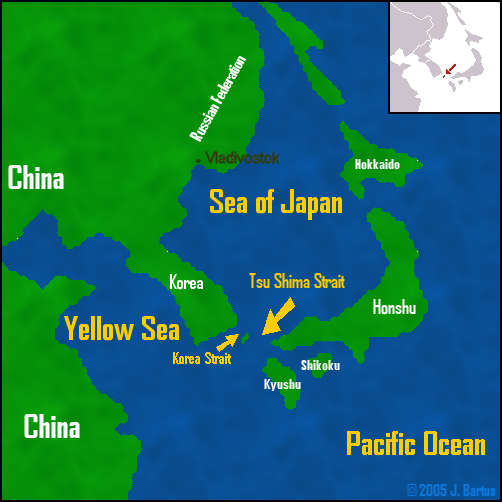 For example, the Battle of Tsushima during the Russo-Japanese War took place in the Tsushima Strait, which is a regional naval choke point. 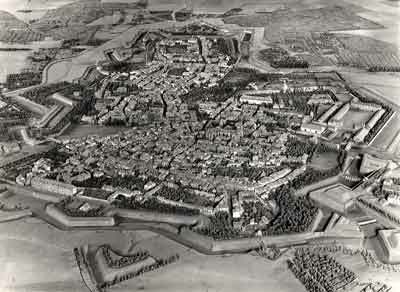 No less significant than geographical or naval choke points are temporal or historical choke points. While the term “choke point” implies obstruction rather than facilitation, the temporal equivalent of a choke point we know as a “window of opportunity,” and this implies facilitation rather than obstruction. But facilitation and obstruction are two sides of the same coin, like the above mentioned distinction between choices facilitated (rendered thinkable) by a given strategic vision and choices obstructed (rendered unthinkable) by a given strategic vision. In both cases we have alternative formulations of the same state of affairs. The Strait of Hormuz: both a military and economic choke point for 40 percent of the world's oil transported by tanker ships. Spatial and temporal choke points usually work together. A battle has a certain duration; even a war has a certain duration, thought it may last a hundred years. The point here is that resources brought to bear after the crucial moment — that is to say, outside the window of opportunity — cannot be used. Thus a tactical delay, as at the Battle of Thermopylae, can be strategically decisive even if the delaying action is a lost battle. Against all odds, the Greeks ultimately kept the numerically superior Persian forces out of Greece, and they did so through a brilliant series of engagements that strategically deployed the far smaller Greek forces at choke points in what was, in some senses, a war of attrition that the Persians chose not to pursue because it was too costly. I hope that it is not lost on the reader that this is precisely what the Viet Cong did in Viet Nam, and what the Mujaheddin did in Afghanistan during the Soviet occupation. Guerrilla wars have always (even if not explicitly) sought out the strategic choke points of numerically larger, technologically superior forces, and concentrated their action where that action could inflict proportionately heavy casualties, making the conflict a protracted and costly war of attrition. If a guerrilla force can maintain this attrition on a larger force long enough to break the political will of the civilian leaders directing the war, they can win even if guerrilla losses are disproportionately large. Sometimes this calculation is a close-run thing, and sometimes the guerrillas are extirpated before the fight becomes unsustainable and impossible for conventional forces, but there is always the possibility of oblique victory by way of the withdrawal of the conventional opponent. As long as tactical and strategic thought is allowed to run in the lazy channels of if only we had more resources — be those resources soldiers, guns, money, time, etc. — the commanders thinking in such terms will be humiliated by more innovative strategic and tactical thinking that looks for the choke points where resources are far less significant than the will to fight. At a choke point, even a small, poorly equipped force can precipitate a decisive moment and turn the tide for their comrades in arms, though they may have to die at the choke point in order to achieve this end. There are, of course, cases in which infinite resources would make a difference. However, this is not the only possibility, because there are cases — battles being a paradigm instances of such cases — when infinite resources would not make a difference (or do not necessarily make a difference). The true strategic thinker seeks these resource-neutralizing nodes and seizes upon them as the opportunity to project power at the least cost to himself and the greatest cost to his adversary. The failed strategic thinker chooses a point at which to concentrate his resources, believing that if he can pour enough resources into a strong point, he can ultimately win despite the losses he will take — like the French at Dien Bien Phu. As I noted above, this calculation can be a close run thing. The Western powers might have failed spectacularly with the Berlin Airlift (arguably an early battle of the Cold War), but they ultimately proved that they could pour sufficient resources into this engagement that it was the Russians who capitulated in this case.